Many young lives are being derailed by substance use. Too many people are not living up to all they can be because they are falling into the trap of numbing themselves with alcohol or drugs. This situation is never what any parent or family member expected or intended. They enter unchartered waters, not prepared for what lies ahead when their child begins using drugs and alcohol, sometimes spiraling out of control. Fear takes over and parents are often left struggling for months or years to make sense of it all. 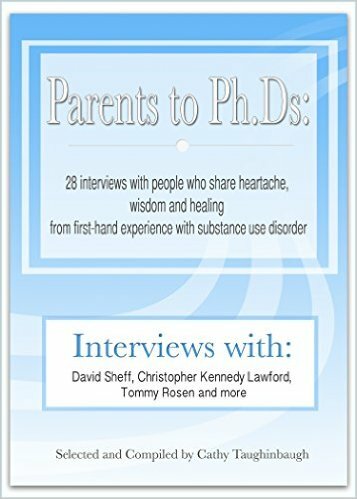 The ebook, Parents to Ph.Ds: 28 interviews with people who share heartache, wisdom and healing from first-hand experience with substance use disorder shares information from all aspects of prevention, addiction, treatment and recovery that can provide answers and a place to start. Coming from different walks of life and experiencing drug and alcohol use from their various personal perspectives, the interviews educate, inform and enlighten the reader. Parents who are now well known authors on the subject, such as David Sheff, Libby Cataldi and Denise Krotcha provide their experiences about what they learned throughout the progress of watching their child move from addiction to recovery. Dr. Ken Winters and Dr. Jeff Foote share their wisdom on the latest research based evidence about what makes a difference for kids that are struggling with drugs and alcohol. Several professionals in the field were also so generous to also provide information about their story and what they’ve learned. Finally, Christopher Kennedy Lawford, Tommy Rosen and Greg Williams whose work continues to be followed by many, express their insights on their personal recovery and how their experiences can benefit the reader. Each interview discusses different aspects of substance use from personal recovery to the ramifications for the family members. Parents to Ph.Ds offers the reader information about how substance use affects individuals and families. The book contains tools and strategies on what you can do to help yourself and your family member.